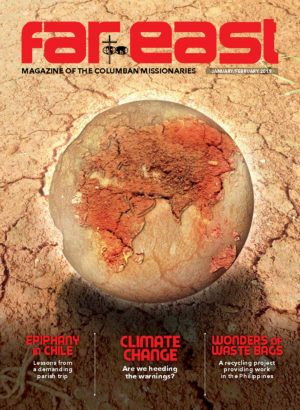 Virgenia O. Vidad runs the Pedalling to Live project which was set up by Columban missionary Fr Oliver McCrossan. She relates how the project has helped Felmar, who has cerebral palsy, to continue his education. I started working for children with disabilities during my college days back 1994 in Ozamiz City. At that time, many children with disabilities did not go to school as school buildings were not adapted for wheelchair users and some of the children were bullied because of the disability. 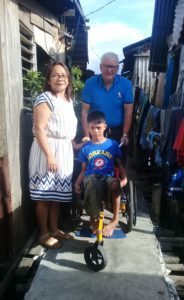 I continued to visit children with disabilities in the different barangays of Ozamiz City and helped their parents lobby the city authorities to allocate funds to children with disabilities. 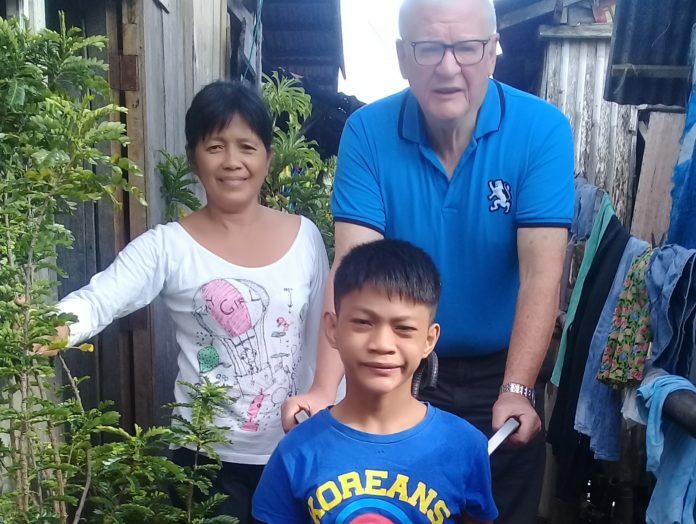 Columban Fr Oliver McCrossan set up the Pedalling to Live and Green Shelter project and one of its programmes was specifically aimed at identifying and helping children with disabilities. The goal of the programme is to train health workers, day care workers to undertake basic interventions as well as to create a referral system to the different agencies that provide education to children with disabilities as well as rehabilitation and medication. In 2011, I met Felmar Tano from Annex, Ozamiz City, who has Cerebral Palsy. He is one of those who has benefitted from out rehabilitation and education programme. Felmar was born 15 March 2003. He has two brothers. Felmar’s mother told us about some of the challenges she has encountered as a mother of a child with cerebral palsy. Felmar cannot walk, but he can move his upper part of the body. He has difficulty in writing due to stiffness of his arms. But despite of his disability he did not stop going to school, instead he is a model student in his class. His classmates welcomed Felmar. Elma Tano is married Fedil Tano and the couple lives with their family near the coastal area in Annex, Ozamiz City. Fedil is a motor cab driver and Elma had a small photocopying business during her pregnancy with Felmar. She was also taking care of the couple’s other children. The life of a working mother who is pregnant is not easy. Elma gave birth to Felmar in the local hospital. It was a normal delivery but a long one. Sadly, Felmar had suffered a lack of oxygen to the brain during birth and so was sent to neo natal care. During the delivery, Felmar did not cry even once and the couple were worried about their son. In her prenatal consultations there was no sign of any abnormalities. But when the doctor told the couple, “Don’t expect your child to be normal”, they were devastated. Over time, Elma observed that the palm of her child’s hand was always closed, and he could not move his body like other children. Felmar was very sickly and regularly hospitalised from an early stage. At the age of six years old, Elma brought Felmar to a neurologist and he was diagnosed as Epileptic and mild cerebral palsy. He was given a phenobarbital but as the medication was expensive, Elma had to stop giving it to him. She was also worried it might damage another of Felmar’s organs as a side effect. Elma enrolled Felmar at SPED School in order that he could socialise with other children and to ensure he got a basic education. As he had no wheelchair, Elma carried Felmar every day from the gate of the school going to his home. 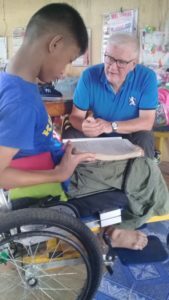 The Pedalling to Live project was able to help Felmar in securing therapy every day at Oroquieta Rehabilitation Centre for one year to help with the stiffness in his arms and legs. The rehabilitation centre is one hour from Felmar’s home. Sadly, the therapy was discontinued due to its cost. Elma’s was anxious that Felmar would be trained to undertake care of his personal hygiene despite his disability. He can now bath himself alone. In 2010, I talked to Elma and the teacher at the SPED school so see if we could transfer Felmar to a regular school so that he can be graded and finish his elementary schooling. The idea was granted and Felmar was enrolled at Baybay Elementary School and both the parents and Felmar were happy. At first the teacher in his new school was hesitant to accept Felmar because she felt he might be a distraction for the class. We insisted that they should accept Felmar as mandated by law. We did this not only for Felmar, but as a motivation to other children with disabilities and for inclusive education which must be implemented in the society. As a community worker I believe that the person with disabilities doesn’t need pity, they need the proper implementation of the programmes and services due to them. After a couple of months, the teacher reported that Felmar was doing well in his class and was an inspiration to his classmates. Felmar is now in his Grade 4 and trying to cope up their daily lessons even if he cannot write properly due to arms stiffness. But Felmar has never considered his disability as a barrier. Every day his mother pushes his wheelchair from home to school there and back. 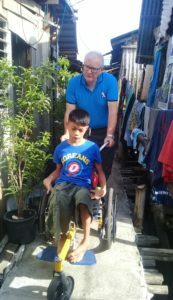 Felmar has a customised wheelchair from Wheelchair for Education in Australia. Now Felmar needs an IPAD that can be used for his exams and other lessons. The teacher will send all the topics to the IPAD, quizzes and exams through email so that Felmar can cope with all the lessons. According to Felmar he is more comfortable using an IPAD rather than writing. It takes time for him to finish an exam and copy the lessons. But at present the parents of Felmar cannot afford to buy IPAD. 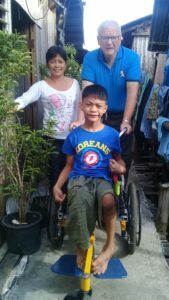 Last year I went to the local authorities with Elma to ask them to make a cemented pathway from Felmar’s house because their original pathway is made of bamboo and it is very difficult for them to push the wheelchair. Part of our request was granted but still there is a sandy area that needs to be cemented because it is difficult for Elma to push the wheelchair on it at the moment. Felmar’s dream to finish his college. 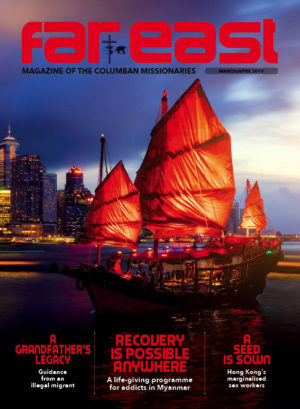 Support Columban projects by donating online here: https://columbans.ie/donate/ You can send a donation by post to: Missionary Society of St Columban, Dalgan Park, Navan, Co Meath, C15 AY2Y. Telephone: 00353 46 9021525.